With Spring right around the corner, what better way to enjoy the warmer days ahead than this stunning home on Fish River? 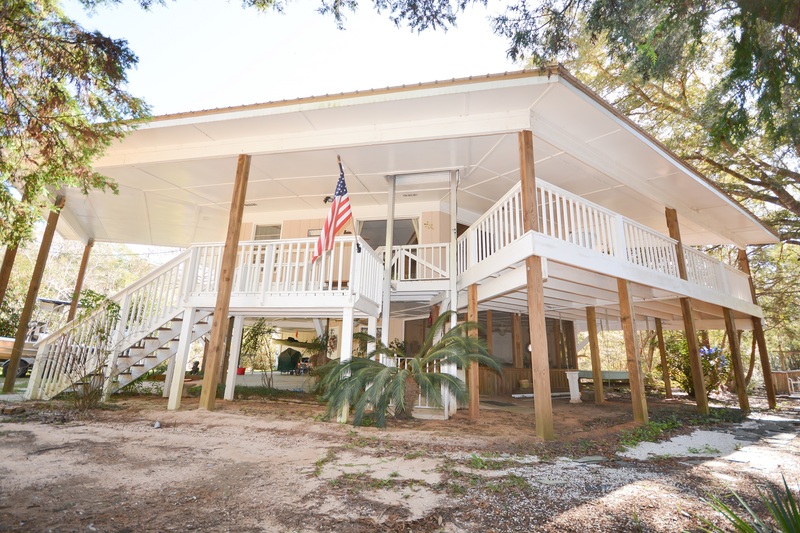 Located in the Marlow Haven subdivision in Summerdale, 16021 Bonner Drive sits on a peninsula right on a beautiful inlet with panoramic views of the water. This home was clearly designed for entertaining with 4 bedrooms and 3 bathrooms on the main level. A deck wraps around the home with separate entrances from the Master and guest bedroom. The deck extending off of the living room provides an ideal outdoor entertaining space where you can enjoy cool breezes while watching the boats ride by. The elevated home allows for prime water views and has plenty of room for parking. Featuring a covered elevator, this home is accessible to anyone. Inside, the home is light-filled and open. The home’s rounded shape is ideal to not miss any of the beautiful scenery. In this open concept home, the features of the living room include two sliding glass doors that lead to the covered deck and a beautiful tongue & groove white oak ceiling. The tongue & groove ceiling is also found in the kitchen that features custom cabinets and breakfast nook. The master suite is a light and airy bedroom complemented by the en suite bath with a large vanity, walk-in closet and a separate room with toilet and shower. 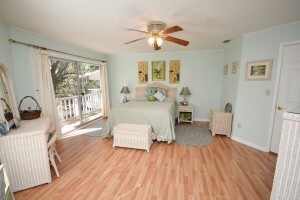 A guest bedroom suite, with water views and en suite bath is also located on this floor. Two additional bedrooms share a Jack and Jill bath with one featuring a large sliding glass door that leads out to the deck overlooking the water. Downstairs you will find a bonus recreation room with a full bath, kitchenette, screen sitting room and plenty of storage for your kayaks and fishing equipment. In addition to the highlights of the interior space, there is also much to enjoy outside. The landscaped front yard showcases beautiful large palm trees and fruit trees. 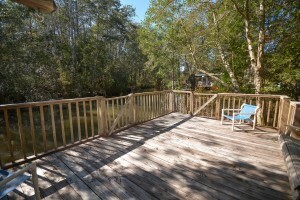 On the water, a large boat dock deck with a built in porch swing can be found. 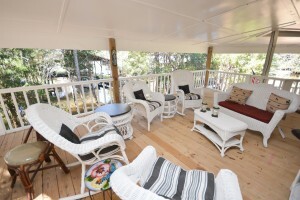 This area is surrounded by natural foliage including beautiful oak trees which creates a private place to enjoy the beautiful weather while gathering with friends and family. Another feature of note is the outdoor cleaning station, perfect for preparing the catch of the day.